For the sixth time in 2017, and the first time in two races, there’s going to be a short field for Sunday’s Cup Series race. 39 drivers are listed to attempt the 40-car field. Missing this week is Tommy Baldwin Racing, which two weeks ago at Texas finished 27th with J.J. Yeley. Given the team’s past emphasis on plate racing, expect TBR to return at Talladega in two weeks. Derrike Cope continues his return to Cup competition this weekend for his first Bristol start since August 26, 2006, when he finished last in Raynard McGlynn’s #74 Dodge. The Low T Center, which backed Cope’s #55 at Texas, is listed as the sponsor for teammate Reed Sorenson in the #15. Cope is one of three drivers with no sponsor listed. 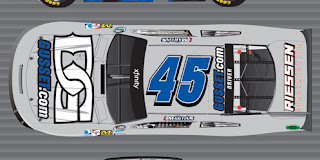 Joining him is Matt Kenseth, who was also without backing at Texas, and the Rick Ware Racing entry of Timmy Hill. Hill’s sixth start of the season in Ware’s #51 Chevrolet will mark his first Bristol start since August 2015. At Texas, Cole Whitt’s longtime sponsor RTIC Coolers returned to the hood of TriStar Motorsports’ #72, the first race of an eight-race deal in 2017. The scheme returns this Sunday, where Whitt looks to improve on a career-best 27th at the track in the spring of 2015, back when he was driving for Front Row Motorsports. Two more drivers to watch will be Trevor Bayne and Matt DiBenedetto, who finished a strong 5th and 6th in this race last year. Bayne comes into Bristol off back-to-back 13th-place finishes in the #6 AdvoCare Ford, hanging on to 12th in points without a single DNF this season. DiBenedetto, who drove for BK Racing last year and Go FAS Racing this season, looks for a turnaround after runs of 35th and 31st the last two races. Cosmo Motors, which sponsored DiBenedetto’s car last spring, returns to back Go FAS’ #32 this Sunday. Jeffrey Earnhardt enters Bristol with three last-place finishes following a hard crash at Texas. Last year, The Motorsports Group finished 33rd and 36th at Bristol, but Earnhardt outpaced the team both times, finishing 32nd and 29th. Little Joe’s Autos and Curtis Key Plumbing are still listed as the sponsor for Earnhardt’s #33, but don’t be surprised if that changes: the team has continued to excel at grabbing up last-minute sponsorship by race day. The preliminary entry list shows 42 drivers to attempt the 40-car field, a second “Dash 4 Cash” event which excludes Cup veterans with five or more years of experience. This weekend sees the return to XFINITY Series competition for Tommy Joe Martins and his team, Martins Motorsports. In 2014, Martins made 11 XFINITY starts, a season highlighted with a 14th-place finish at Talladega. But it was at Bristol that year where driver and team struggled the most as both Martins and teammate Willie Allen were the only two sent home. This year, after a season and change in the Truck Series, Martins and sponsor Diamond Gusset Jeans are back, looking to kick off a nine-race schedule this season. Back for the first time since Daytona is Rick Gdovic’s #46 Chevrolet. In place of Belgian road racer Anthony Kumpen, who ran a solid 22nd at Daytona, ARCA driver Quin Houff looks to make his series debut. The 19-year-old Houff (pronounced “howf”) brings with him backing from the Duke Cancer Institute, which backed his ARCA debut with Mason Mitchell’s team, where he ran 28th. The #46 may again turn heads as they did in this race last year, when Brandon Gdovic finished 18th. Owner-drivers Morgan Shepherd (#89), Mike Harmon (#74), Mario Gosselin (#90), and B.J. McLeod (#78) have all made this week’s preliminary list. Harmon and McLeod are among the five teams whose primary sponsor has yet to be determined. Joining them are Jeff Green in McLeod’s #8 Chevrolet and both Motorsport Business Management cars of Timmy Hill (#40) and Carl Long (#13). In this race last year, Shepherd and Long missed the field while the best run of the group belonged to Gosselin, who finished 24th, three laps down. Obaika Racing has again entered just one car, the #97, with Stephen Leicht behind the wheel. Josh Bilicki, frequently withdrawn from entry lists this season in the second Obaika #77, has now been tabbed as the road course ringer for Rick Ware Racing’s Cup team, which he will drive for at Sonoma and Watkins Glen. Texas saw Jordan Anderson finish last for the fourth-consecutive XFINITY Series race, tying a mark set three times prior by Jeff Green. Anderson, who continues to work out of Mike Harmon’s shop on his own Truck Series effort, is again entered in RSS Racing’s #93 Chevrolet, and may be expected to make it five in a row.